Outsiders often wonder what they are, those colorful cans, powders, pills, potions and lotions wrapped in the most colorful cans, boxes and papers. They fill the shelves at shops that appear to be pharmacies of some sort. Or first time visitors are puzzled by the ladies in traditional sarong and kebaya, going from house to house in residential areas. They deliver the neighborhood households with strangely colored brews, served in glasses. 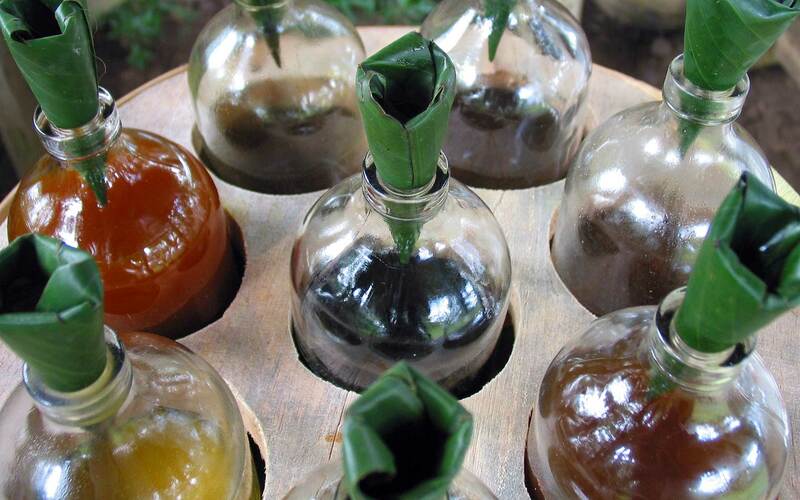 Each day of the year, their customers expect their daily shot of a typical Javanese-Indonesian medicine. Almost all Indonesians are familiar with this phenomenon. Nearly three quarters takes a daily shot of natural remedies to cure minor ailments, get better looks or generally increase their sense of well-being. It is part of a unique Indonesian approach to health, based upon herbs mixed according to ancient wisdom and formulas first applied in the kraton of Java. People call it jamu. There is jamu to cure a simple cold or to strengthen the liver. Some potions are said to lower one’s cholesterol or remove pimples. There are quite powerful concoctions to increase one’s sexual appetite. Others will have the opposite effect! There are pills to to alleviate all sorts of pain or improve one’s stamina. You want to stay awake or rather fall asleep more easily? There is a jamu cure for every complaint. Even in Indonesia, there is no clear-cut definition of what exactly jamu is. It is almost impossible to make a clear distinction between medicine and cosmetics. Often one jamu can be applied to cure several types of ailments or to obtain different results, depending on the situation or the condition of the user. Jamu promotes a holistic approach, based upon the relationship between ‘hot’ and ‘cold’ ailments, of which both can be cured by opposite medicines. But together with the curing effect, jamu will also consider its effect upon the rest of the body. Therefore, jamu based cures follow these principles: curing ailments or small predicaments, improving the blood circulation, reduce all sensations of pain and enhance body functions.